In the world of social media, peer recommendations are more powerful than any advertising or marketing strategy. Considering that many purchase experiences are based on how your customer feels, their experience should not be understated. The best way to improve your customers’ experiences is to give them what they want and a simple solution, is to listen. Simple, no? But with many businesses being preoccupied with hitting targets and launching their latest product, they fail to take the time to listen their audience. To create brand champions of your business, show your customers that you respect their interests and value their opinions. 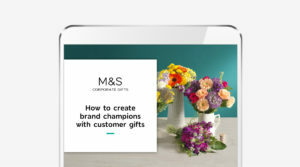 Empower your customers to spend it well with an M&S gift card. To find out more on how to create brand champions through customers gifts, submit an enquiry or give us a call on 0330 0580 734.